Man City have Yaya Toure, Nigel De Jong and David Silva. Chelsea have Raul Merieles, Lampard and Essien. At Spurs it is Luca Modric, Scott Parker and Rafael Van Der Vaart. Beyond the top four, Arsenal prospect Jack Wilshere and Liverpool Captain Steven Gerrard are probably the best. But who exactly has the best midfield England? If it sounds surprising that is because the media have been deriding United's midfield ever since the day Roy Keane left back in 2005. Two months after the Irish legend's departure United were forced to field a central midfield partnership of Rio Ferdinand and Wayne Rooney in a cup match at Wolves; Alan Smith was a regular in the centre of the park in those days; while Paul Scholes was sidelined for the season with an eyesight problem. Those were bleak times indeed for the reds. The following summer Sir Alex unsurprisingly spent big on Micheal Carrick. The results were instant. United won the league. The following season Owen Hargreaves and Anderson arrived to bolster the engine room. A league and European Cup double followed. Meanwhile, Darren Fletcher was maturing nicely to ensure the reds had plenty of options to choose from. There have certainly been times over the past few years when the red's midfield has been below standard. The first two thirds of the 2010/11 season was particularly poor; especially away from home where United struggled to control the tempo of games effectively and found it hard to maintain possession. Oddly, the media consensus was that United needed a creative player in the centre of the park. But why? There was certainly no lack of goals or creativity in the side. Nani ended the 2010/11 season on top of the Premier League assists chart. Wayne Rooney was not far behind him with Giggs, Valencia (when fit) and Berbatov contributing significantly too. Add in the fact that United finished the season as champions of England and runners up to Barcelona in the Champions League, they were hardly a team desperately in need of creativity. But if creativity was not the problem then what was? Among those who did not buy the creativity argument there were many who still longed for strengthening in midfield. 'We need an animal; someone like Roy Keane' a rather drunken red told me on the tram home from Old Trafford one Saturday. United were lacking drive and steel in the centre he seemed to suggest. But to what end? If goal scoring was not a problem and United's defence remained sound in the hands of Nemanja Vidic (animal enough for ya?) why throw a raging bull into the mix? Of course there was no need for such an 'animal' any more than a creative spark. United already had the players they needed - in fact they had several of them. They were not classic play-makers or 'box to box generals'. They were simply footballers; control players with touch and calmness but also vision and guile. The problems in midfield has arisen because Ferguson had not been able to get the best out of any of them for various reasons. Michael Carrick was struggling for form which he rediscovered toward the end of 2010/11 and has maintained since. 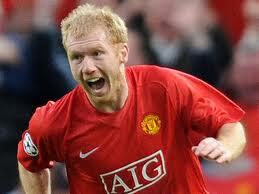 Paul Scholes was injured for long spells,along with Ryan Giggs and Tom Cleverly was at Wigan on loan. Darren Fletcher missed the second half of the season with an illness and Anderson too was curtailed by fitness problems. But Sir Alex Ferguson did not panic; blessed as he is with the luxury of being able to plan for the long term when all other managers must deliver instant results. Ferguson also understands better than most what is required of a modern midfielder. That United's and Barcelona's midfield have more in common than meets the eye is seldom mentioned by pundits. What many fail to acknowledge -or to even realise - is that Manchester United have employed a similar approach to Barcelona in their midfield play since 2006. Ferguson, faced with Chelsea's millions and all the powerful athletic midfielders Abramovich's money could buy, decided to adopt a new approach. He signed the cultured, if somewhat timid, Micheal Carrick and paired him Paul Scholes. Both players liked to pass the ball. Neither was noted for athleticism or power. There was no room for the 'holding player' or the midfield general; just two stylish footballers who like to play passes. It was a pairing that was to help win the next three league titles. Similarly, Barcelona paired Xavi and Iniesta, with Busquests 'holding' in a variation of the same approach. In 2007 Ferguson altered the style of his forward play too, positioning Tevez as a withdrawn striker with Rooney pulling wide and Ronaldo, nominally a winger, coming through the centre. Barcelona under Guardiola did likewise, shifting Messi to a more central role and leaving Eto'o and Henry to man the flanks. Both teams have dominated the Champions League since and if the similarities between the sides have rarely been highlighted by the pundits, they have certainly not escaped the notice of the players themeselves. 'In the last 15 to 20 years the best midfielder I have seen – the most complete – is Schloes. He is a spectacular player. He has everything' Barcelona's Xavi said in 2011. Since Scholes opted to come out of retirement in January his rekindled partnership with Carrick has been impressive. With Carrick's form as good as it has ever been in a United Shirt and Scholes abilities undiminshed United have been dominant in midfield. The results have been good too with victories against Manchester City, Liverpool, Stoke (when the reds managed 836 passes), Ajax and a draw away to Chelsea. In each of these matches United controlled the ball with Carrick completing more passes than anyone else on the field. There are reasons to be cheerful. Tom Cleverly is on the way back too. It is an exciting prospect. Cleverly, as his name suggests in a clever footballer in the Barcelona mould. We have yet to hear from Xavi what he thinks of him but it is surely only a matter of time. There is every chance that Cleverly will become one of the most respected players of his generation. Like Scholes and Carrick he is neither the classic playmaker nor the midfield general. He is simply a footballer; and a fine one at that. Beyond the Carrick, Scholes, Cleverly trio there is plenty more to admire too. Darren Fletcher will return at some point and has plenty to offer; as has Anderson. Paul Pogba is emerging from the youth set up with a big reputation. Ryan Giggs, at the the other end of the age spectrum is still a world class player and Phil Jones has shown that he too can catch the eye in the centre of the park. There is simply is no other club in England with this range of quality midfield players. Spurs have the best play-maker in Modric. Scott Parker and Michael Essien are fine players that would strengthen any team. But what happens to Spurs when Modric is injured. We have seen how Chelsea have suffered without Essien. By contrast, United have been able to absorb their midfield injury problems and maintain a title challenge. It will be interesting to see who Ferguson selects when everyone is fit. Carrick is undoubtedly number one at the moment; topping the passing charts every single week as he does. Paul Scholes and Tom Cleverly are likely to compete to partner him; but whether Ferguson chooses a midfield of Valencia Carrick Cleverly Giggs or Nani Anderson Scholes Young, few would bet against United getting the right result. Interesting read. Were not as bad as the media suggest, if we was we wouldn't be second and current league champions. do you do link exchange with other UTD blogs mate?